We are always told to follow our dreams. Moreover, we are often told not to pay heed to criticism. But this is easier said than done. If a person you respect criticizes you, you start doubting yourself. This leads to a crisis of confidence. The same thing happened to Claudia Luethi. As a high school student, her art teacher would praise her and showed he work as an example to other students. But he always gave her a low grade because he thought she did not work hard enough. She did not deal with this criticism well and never went to art school due to her shattered confidence. Being a renowned artist herself, her unique fine arts and abstract arts are an inspiration to millions! Moreover, she is a proud ShowTainer on ShowFlipper! Claudia never lost her passion for art. She got a job as a secretary and continued painting in her spare time. She went on to take a job as a marketing assistant, which is when art came back into her professional life. For a particular campaign, they had the assignment to paint a cow. Claudia finally got a chance to showcase her talent and she took it with both hands. She now has her own show on ShowFlipper. People fell in love with the three-dimensional effect she created. Her canvas seemed living, as though breathing. She discovered her ability to create pictorial, lifelike effect with just brush strokes. They soon began asking about the creator of the 3D paintings and Claudia's career took off. The struggles of an artist came to an end and the young artist in her that was waiting to emerge all these years erupted in full form. Her show at SF Studio is stacked with paintings that look lifelike and capture a wide range of landscape painting, cityscapes,and animals. 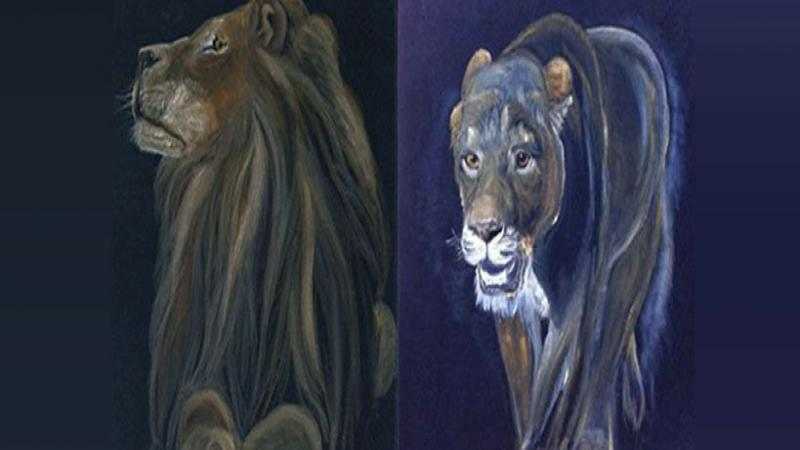 Once she started to paint again, she stumbled upon her passion for wildlife painting and worked towards it. Her creations on ShowFlipper like Proud lion and Scandinavian village look completely pictorial by its three-dimensional effect. Her oil paintings are noteworthy in every dimension! Despite many people telling her to stick to abstract painting, Claudia stuck to her passion and continued to paint creations that stand apart from others. Claudia Luethi is no more the young secretary with a simple job; her work on ShowFlipper revolves around capturing landscapes and wildlife into lifelike eternity on canvas. Indian cricket legend Sachin Tendulkar rightly quoted,"Having, and seeing your dreams is very important, and so is chasing those dreams. You see dreams when you sleep, and as you chase your dreams, it keeps you awake. So it's important to stay awake. Stay Awake, Stay Beautiful." Good or Bad Criticism, Stand Tall! If it is good criticism, then you can value it and build upon it. However, assuming criticism hurts, then how do you really deal with it? You can be into contemporary art or abstract art or may be dealing with fine art; criticism will be something you will not be able to avoid. So, you are an artist and have put your work of oil painting art out there, out in the world for everyone to view it. It can be an actual art critique, a family member, a fellow artist or friend or the general public who has just stepped into the gallery exhibition. With social media, blogs and innumerable websites, you have a plethora of channels to exhibit your work. While this is great, you can also be subjected to an amazingly large number of criticisms. Firstly, accept that different people have different tastes and not everyone will like your work. This is not meant to be. Your pop art may not be a flavor for someone else. So the sooner you realize the better for you. Always separate your emotions from your artwork when you put up for an exhibition. Please remember that people are not critiquing YOU as a person, but the painting you have created. Being a young artist you might get very depressed, during your first few weeks of Art College when every drawing, or idea design, you present gets shot down. Like every artist, you also have to learn to make a choice. Either learn to control and distance your emotions or you have to just stop learning that art. When you open yourself up to the real, honest assessment of your mentors and peers, you become a better artist. Trust me, it is worth it, but you certainly have to choose to accept good criticism before you are able to move ahead. Criticism can also be handled with art therapy, a concept that most people are not aware of! Here is a good read! Through away that big ego of yours, get out your pocket journal and get you ready for the long critique of ten odd people. Each one will have several things to point out to, and you won’t be able to remember each and everything that each person said without penning some of it down. Pen down a quick and short note for each separate thing that is mentioned during the session, and then later when you are all by yourself, take some real good and the long time to review the critique. The thing is, this helps people to be more constructive about what they have to say because they know you’re taking them seriously and paying attention and that you are mindful of their opinion. You can try this out in your own peer group and see what happens. Here is a fantastic blog that depicts the artists who bore the brunt of intolerance! You should always remember that a critique is just some kind of advice from other people, and like it happens with all advice, some of it will be unnecessary, bad and unwanted. You have to learn to separate the good from the bad and pick only what can be useful to you. Never change your style of thinking or your way of expressing things based on the criticism. Just improvise on it. Weigh the merits of what the world’s critiques are saying and grow as an artist. You can now avail the best art forms and photo art of Claudia on https://www.showflipper.com a unique and trending art site that is a house to the latest and greatest art forms of the modern times. Get a view on the exclusive abstract arts, fine arts, and digital arts for getting amazed to the core!